Give Me My Remote > Grey's Anatomy > Is T.R. Knight Leaving GREY’S ANATOMY? Is T.R. Knight Leaving GREY’S ANATOMY? In one of the most shocking moments in GREY’S ANATOMY history, Meredith discovered that the John Doe hanging on for dear life after being hit by a bus was actually George O’Malley. The final scene left viewers unsure of the fate of George as well as Izzie (Katherine Heigl), who also toyed with death in the episode. Helping to spur on the speculation was the off-screen drama that surrounded T.R. Knight and Katherine Heigl’s relationship with the show. Both had been rumored to be unhappy. Sources say that T.R. Knight went as far as requesting that he be let out of his three year contract early. But was that true or was the media just running rampant based on rumors? Officially neither Knight nor showrunner Shonda Rhimes have commented on the speculation. Allegedly Shonda Rhimes had hoped Knight would be around for a few episodes next season, but that’s not happening now. So there you have it. T.R. Knight is leaving GREY’S ANATOMY. Dr. George O’Mallery, one of those show’s most central characters (at least in the early years) is leaving us for good. Talk to me GREY’S fans…do you care? Will you miss George? What do you think this means for the fate of Izzie? Will the show move on easily without him? Well that doesn’t exactly surprise me, he has had 5 min screen time each episode this season. I would be frustrated too if I was in his position. Hopefully he will move onto better things. I originally thought after the season finale that only one of them would live, and it would be George. But I guess not. I say keeping George and losing Izzie would have been the way to go! It’s definitely not surprising. 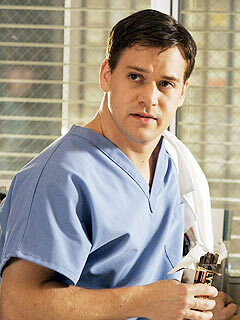 I just wish it had been the reverse, George in/Izzie out. It was pretty obvious he was dead though. He was off the elevator and happy while Izzie still hadn’t stepped off and seemed contemplative to do so. T.R. will be truely be missed no one can ever replace him as George. I hope he finds happiness wherever he goes. We LOVE YOU T.R.! As for Izzie if T.R. is out they can’t let Izzie die because, that would hurt the show. Grey’s anatomy is the best MD show around continue to grow and your fans will grow with you. I hate to see him go… but he can be proud to have been in one of the most shocking moments in MY TV history – it was a great way to make an exit. I will miss George but am not surprised. I hate that he’s leaving, but I understand why he wants to. Honestly, I’ll probably stop watching — he’s my favorite character. I will miss George, that was a very sad departure. In a strange nod to the unpredictable nature of Hollywood, I believe that T.R. Knight’s departure from Seattle Grace was set into motion by the producers’ decision to let Isaiah Washington go after Season 3. While I would never condone Washington’s hateful speech, there appears to have been two significant consequences to that casting shake-up. First, the public relations fallout from the incident between Washington, Knight, and Patrick Dempsey thrust T.R. onto the front page of countless tabloids and newspapers, and put him in the position of being a national spokesperson for a very private aspect of his life. With only a handful of credits on his resume prior to landing the part of George, the jury was out on how a young actor, inexperienced in the ways of celebrity, would handle such intense media scrutiny. In the short term, Knight appeared to benefit from the controversy, with fans, journalists, and opinion leaders rushing to praise his calm and dignified exterior. With the benefit of hindsight, I believe that Knight may have read a little too much of his own press and misjudged his value, both on Grey’s Anatomy and in the entertainment industry as a whole. Both T.R. Knight and his good friend Katherine Heigl (who has been the subject of behind-the-scenes nightmare stories regarding salary and storylines since Roswell) have overplayed their hands, but Heigl remains because the show’s ratings benefit from the presence of America’s newest romantic comedy star. Until Knight figures out how to snag the lead in a Judd Apatow flick, I believe that his diva act will be a mistake that he will always regret. Second, the absence of Dr. Burke gutted Grey’s Anatomy of its most engaging relationship, that between mentor and pupil. I am a sucker for these types of storylines, as are many viewers. Despite an off-screen relationship that was obviously imperfect, Knight & Washington were must-see TV every time they shared a scene. Neither actor was ever as good on Grey’s as they were with one another, and I miss seeing O’ Malley running around the hospital, trying to earn the respect it took to be “Burke’s Guy.” Once that relationship was fractured, and the writers attempted to move George in a new, more mainstream direction, we were subjected to the Gizzie storyline. Need I say more? I don’t know T.R. Knight, and I hope that the next phase of his career provides him with the creative satisfaction that making $100,000+ per episode on Grey’s could not. I would give him this piece of advice, though. When Knight emerges from the shadows to give his first “post-Shonda” interview, he needs to be very careful not to bite the hand that fed him millions of dollars. With so many fans having experienced true financial hardship in the past few years, I think Knight would be well-served to take the high road. Why then, do I worry, will he do the exact opposite? I think the thing is, that even though this season TR’s on screen time wasn’t that big, I feel like he served at times as a good comedic interval. I do think his character was weakened after the departure of Burke. To be honest I think Grey’s Anatomy needs to shake up some of its characters and bring some new chemistry. I can’t see where they will head in the next season. My favourite characters at the moment are Lexi and Sloane. The rest of them seem to be suffering from repetive and drole storylines. fingers crossed it’s not all down hill from here. George was truly my favorite character on grey’s anatomy; i was devastated when i watched the finale and then researched it and discovered that he would no longer be in the show! He was the funny guy, the sensitive guy and his character differed so much from that of all the other cast. There was nobody quite like him and i personally think that the show will loose some of its sparkle that will never really be able to be brought back after the loss of T.R Knight. Even though he may not have been getting as much screen time recently as before, any time he was on screen was a moment enjoyed by many. I will not miss the character of George. For the past couple of years, it’s been a bore watching this hapless young doctor trudging around Seattle Grace with a hangdog look, speaking in slurred speech that made me think of Tommy Smothers. The affairs with Callie, Izzy and Meredith seemed forced and not completely believable. Most of the responsibility lies with the writers and not with T.R. Knight’s portrayal, but I feel that the character added very little to the show in the recent past and eventually outlived his usefulness. R.I.P., George. You’ll find undoubtedly a lot of details like that to take into consideration. That is a great point to bring up. I offer the thoughts above as common inspiration but clearly you can find questions like the 1 you bring up exactly where the most essential thing will be working in honest great faith. I don?t know if finest practices have emerged about things like that, but I am confident that your job is clearly identified as a fair game. Both boys and girls feel the impact of just a momentâ€™s pleasure, for the rest of their lives. Maintain all the articles coming. I love reading by way of your things. Cheers.